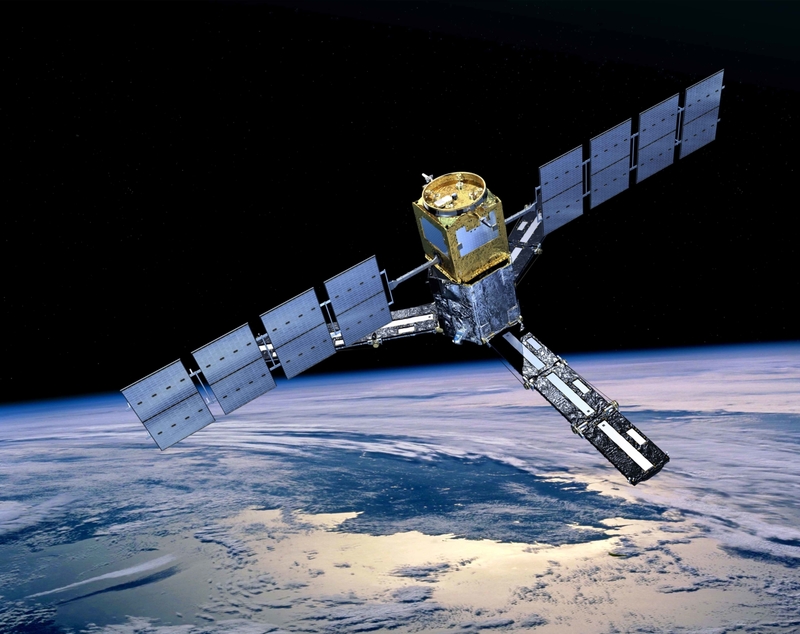 The European Space Agency Soil Moisture and Ocean Salinity (SMOS) mission provides multi-angular L-band (electromagnetic frequency of 1.4 GHz) brightness temperature images of the Earth. Because upwelling radiation at 1.4 GHz is significantly less affected by rain and atmospheric effects than at higher microwave frequencies, the SMOS measurements offer unique opportunities to complement existing ocean satellite high wind observations in tropical cyclones and severe weather that are often erroneous in such conditions. 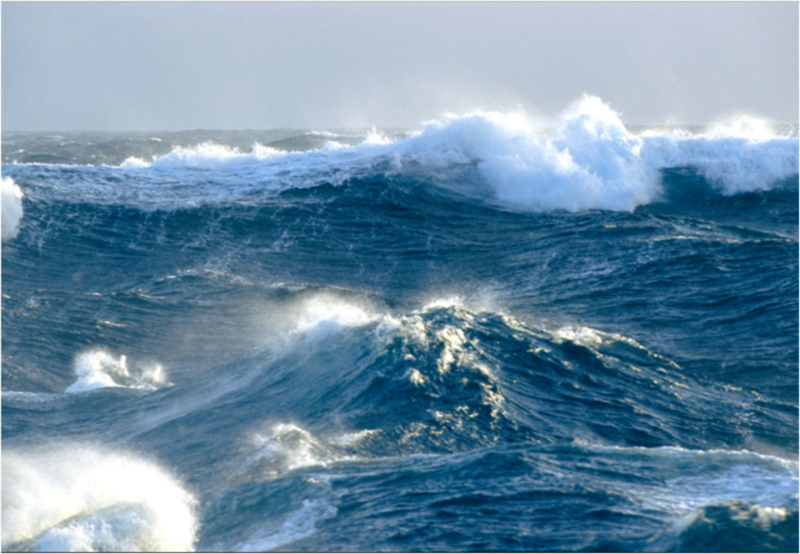 The physical basis for surface wind speed retrievals in extreme weather from passive microwave radiometers involves emission from a rough, foam-covered sea surface. 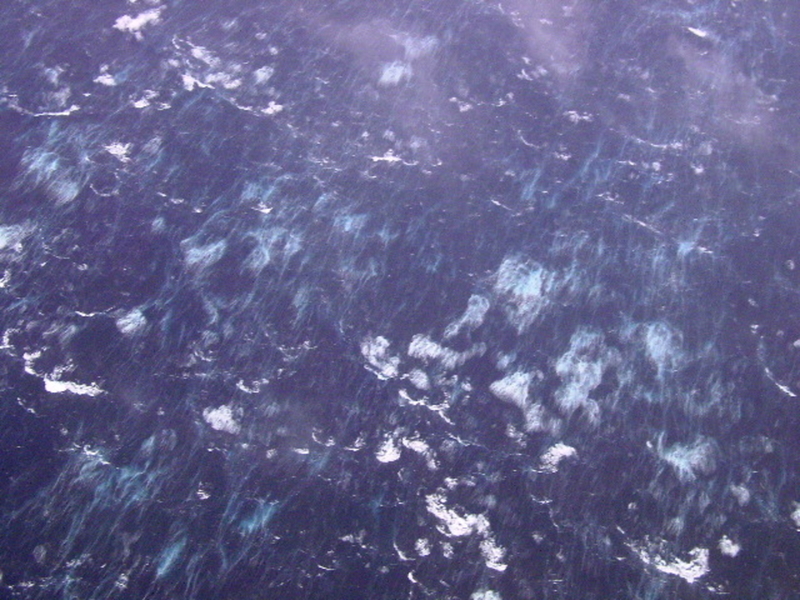 The sea state within tropical cyclones is complex (see picture above) and varies according to the storm sectors, but in the region where the wind speeds exceed tropical storm force (>17 m/s ~34 knots), breaking waves generate extensive foam patches and deep bubble layers. Foam patches are associated with high emissivity at microwave frequencies. The foam horizontal coverage and thickness extension as wind speed increases towards hurricane force and the associated emissivity increase are the basic principles for wind retrievals from radiometers. This information can be used as a means of remotely measuring surface wind speeds in hurricanes from airborne, or spaceborne, microwave radiometers. The Step Frequency Microwave Radiometer (SFMR) operating at C-band (4-8 GHz), which is the US/National Oceanic and Atmospheric Administration (NOAA)'s primary airborne sensor for measuring tropical cyclone surface wind speeds (Uhlhorn et al., 2003; 2007), is based on this principle. Photograph of the sea surface during a hurricane (Beaufort Force 12) taken from a NOAA ‘‘Hurricane Hunter’’ aircraft (courtesy Black et al., 1986). The objective of this project is to exploit the identified capability of SMOS satellite Brightness Temperatures acquired at L-band to monitor wind speed and whitecap statistical properties beneath Tropical Cyclones and severe Extra Tropical storms. Such new capability at the core of the project was recently demonstrated during the SMOS+ STORM Feasibility ESA-STSE project ran between January 2012 and concluded in September 2013. The primary aim of the study was to establish if SMOS could retrieve meaningful surface wind speed in tropical cyclones and storms. 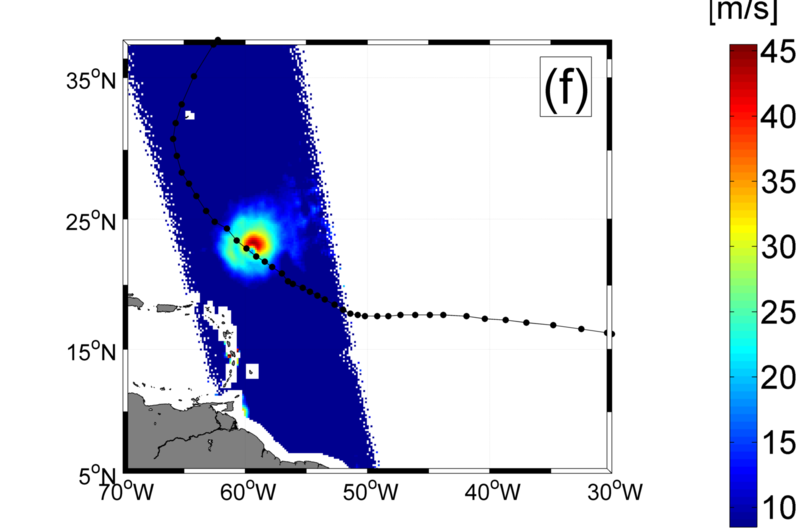 This was successfully demonstrated by analysing SMOS data over the category 4 hurricane IGOR that developed in September 2010 [Reul et al. JGR, 2012]. Without correcting for rain effects, the wind-induced components of SMOS ocean surface brightness temperatures were co-located and compared to observed and modelled surface wind speed products. The evolution of the maximum surface wind speed and the radii of 34, 50 and 64 knots surface wind speeds retrieved from SMOS were shown to be consistent with hurricane model solutions and observation analyses. Sea Surface Wind Speed in units of meter per seconds retrieved from SMOS data during the passage of Hurricane Igor North of the Antilles in September 2010. 1. Consolidate the physical understanding of L-band emission characteristics and the physical processes that control its signal dynamics to solidify the theoretical framework required to improve the quality of SMOS derived high-wind speed products. 2. Systematically produce a large ensemble of TC Storm cases and associated validation data that can be used to improve the SMOS retrieval algorithm and product robustness. 3. Disseminate SMOS+ STORM products to the scientific and operational research user community to develop a user base that can nurture and exploit new information from SMOS. The present follow-on project called SMOS+STORMS Evolution started in April 2014 for a period of 2 years and is funded by ESA again under the support to science element program (Technical Officer: Craig Donlon). It aims at targeting the above listed next steps. More precisely, the present project has one overall aim which is to Demonstrate the performance, utility and impact of SMOS L-band measurements at high wind speeds over the ocean during Tropical and Extra-Tropical storm conditions. 1) Improve and consolidate our theoretical understanding of the L-band signal response and physical properties that can be inferred over the ocean during the passage of Tropical Cyclone (TC) and Extra-Tropical Cyclone (ETC) systems. 2) Consolidate, evolve, implement and validate the STSE SMOS+ STORM feasibility project Geophysical Model Function (GMF) and retrieval algorithm for high wind speed conditions. 3) Systematically produce and validate L-band SMOS high wind speed products with uncertainty estimates/flags for ETC and TC conditions over the entire SMOS Mission archive. 4) Develop, implement and validate new blended multi-mission oceanic wind speed products with uncertainty estimates incorporating SMOS+STORM Evolution L-Band measurements at high-wind speeds for TC and ETC events. 5) Generate a global database of TC and ETC events over the ocean surface and characterize each event using diverse Earth Observation and other observations in synergy. 6) Improve our understanding and parameterization of ocean-atmosphere coupling and mixed-layer dynamics for ETC and TC cases. 7) Demonstrate the utility, performance and impact of SMOS+ STORM Evolution products on TC and ETC prediction systems in the context of maritime applications.